Summary: Coaching a youth team involves a great deal of preparation and patience. If you’ve become the head coach for a youth soccer team, there’s enormous amount of responsibility on your shoulders. Imagine you’re coaching a soccer game against an undefeated rival that has steamrolled your team every previous match. Now, your team’s off to a good start and has taken the lead. Then, in the last quarter, an official makes a bad call that costs you the game in the closing seconds. Parents are screaming at the official and your kids are looking at you for advice. What exactly do you do now? Remember, coaches play a large role in influencing the lives of children. For instance, ask someone about a meaningful memory that he or she had back in fourth grade. You’re likely to see some blank stares and some maybe hear an “I don’t know” or two. But, if you ask them about a sports memory they had in their youth, you’ll likely hear about a game-winning shot, a hilarious moment or even an injury that occurred to them. These all elicit emotion for years on end. And, the fact that you can partake in these memories will help shape their lives all the way to adulthood. 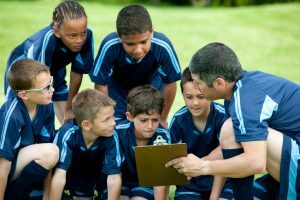 It’s been noted that today’s youth coaches lack the skill and guidance needed to impact the youth of today. Part of the problem is that many adults that serve as volunteer coaches do not receive any formal training of any sort. Most of them become coaches simply because their child is on the team – and they improvise. Rather than focusing on the fundamentals of the game, coaches will often prioritize other non-priorities like buying the latest soccer gear or soccer backpacks on sale for their team. But, one of the bigger problems in youth sports is the win-or-go-home mentality that is embedded in children. Adults often forget that there are fundamentally different approaches to take when coaching a youth team as opposed to an adult team. However, distinguishing the two can be difficult when coaches are so adamant on building a winning culture from the start. This isn’t to say that the spirit of competition should be taken away from the game, but there are limitations, especially if they’re kids. Remember, youth sports is all about education and human development. It’s a foundation for their entire sports careers and can impact the way they see the game in the future. Screaming and yelling at every bad play will only result in a fearful environment and may deter children from playing sports ever again. The experts at Soccer Garage recommend that you take the time to understand all the complexities of coaching to fully enhance your team’s success.